"The name is Zabaniyya, the tormentor of Gehenna. I am a merely a spear for the execution of law---use me wisely, my master." Apply Burn to enemies at target. + -10~-20 CP to enemies at target. Then I will enforce the law. Prepare yourself. Flame Fist of Anger! A raging flame from within! Burn everything up! Yaheem Shegara! That body’s suffering was my responsibility. It seems that there is still hope to save his soul. Master, please don’t mourn. Finally, this body will be judged. A martial artist who has mastered the Fiery Spear Hand. He is a Transient who specializes in torture and can inflict internal burns on a victim. 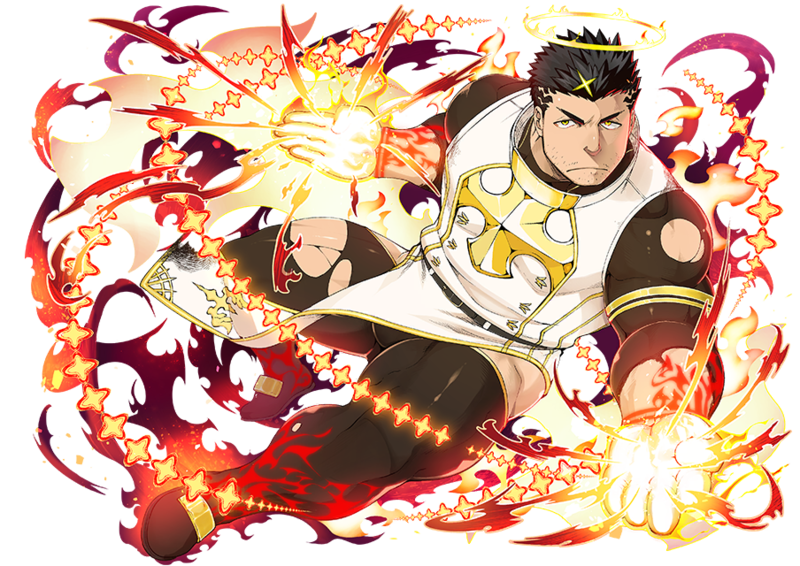 Furthermore, he is a tool of heavens who prioritizes divine law above his Summoner's orders and his own will. He deals with everyone politely and even sinners are no execption. Knowing he is not omnipotent, he is ashamed at the arrogance of his dealing judgment upon others. He defines himself as a tool to be used by others and tries to remain emotionless. He deals the same pain to himself that he inflicts upon sinners as a means of maintaining balance with himself. A Summon from the Department of Torture who is a martial artist with spear hand techniques of fire able to burn enemies from within. He is a messenger from Heaven who places the laws he was given more than even the commands of his summoner or his own will. His polite manner never falters in regards to others including sinners. So long as The Absolute does not take physical form, he is a man who feels shame at passing judgment into others, does not move on his own will, is a tool to be used by others, and kills his own emotions. Also whenever he gives pain to sinners he gives the same amount of pain to himself, which is how he keeps the balance inside himself. From his time working in a certain syndicate in Gehenna, he has become adept at working in large groups. In other words, he does not obect to having a clear and strict chain of command. He follows orders from a Summoner with whom he has a master/servant relationship as well as from any royalty. However, this does not mean he is without emotions. Internal strife rages in him constantly and quietly as he tries to balance reality against his ideals. He does not get along with people who side with chaos or find oorder boring. Because of his experience from the time he worked as part of an organization from the other world Gehenna, he is deeply colored as a structured worker. That is to say, if a hierarchy and chain of command is clearly established, he is the type who would obey and show little resistance. The orders of a summoner bound by contract or those called royalty would be faithfully followed. But by no means does he not possess feelings. The conflict between ideals and reality is always quietly burning within him. He is fundamentally at odds with those who perceive order to be tedium and are the kind to love chaos. Zabaniyya are the angels of hell in Islam. They are said to be brutish and violent and act according to the will of god. Both jaḥīm (Arabic) and shegārā (Syric) are names for the Islamic concept of hell, jaḥīm is where pagan believers would fall, and shegārā which means "raging fire". 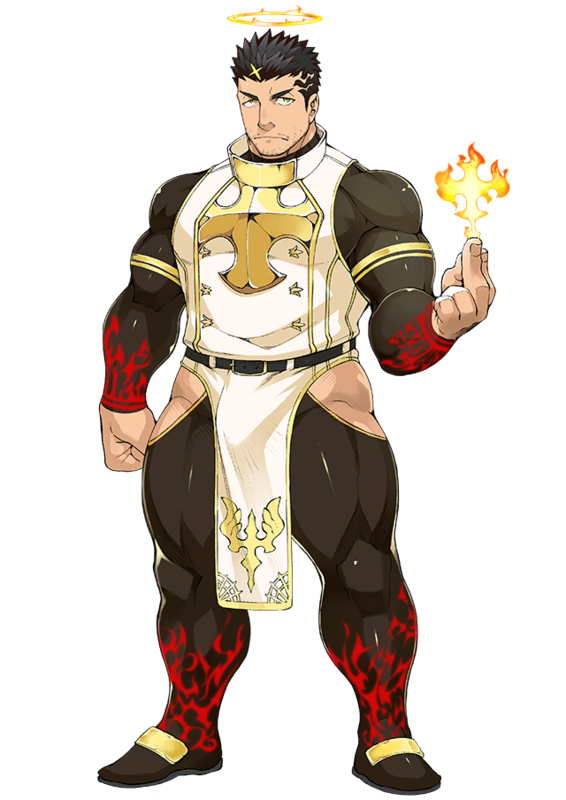 His Role is "Torturer" and his Rule is "Hellfire." Whatever he's hot I'll forgive it. Boo-hoo, I hate to torture people for reasons I don't even understand but I keep doing it anyway. Woe is me. This page was last edited on 15 December 2018, at 20:01.